I had guided these two gentlemen before on the river Stour earlier in the year. They had caught a few chub but none of the larger fish. We saw some really larger chub however with the low water conditions they were difficult to tempt. 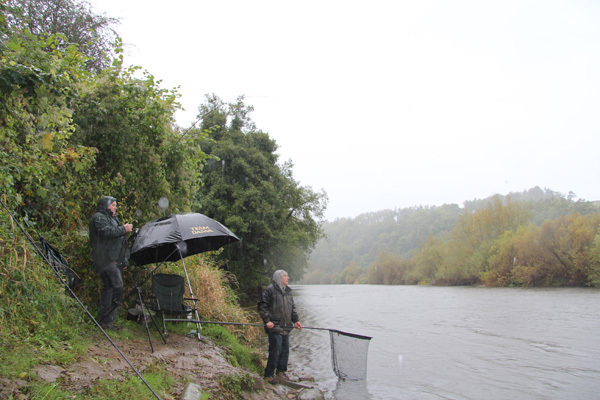 This time we were on the Wye fishing for barbel. The river had been really low for much of the summer and early autumn, however a little rain had pushed the height up and it looked spot on as we walked to the swims. The anticipation of what lays before you on this river for the day is really exciting, or it is for me. We met and walked to the swim on the beat. It’s quite a short stretch of river but can be very good at times. Rob and Stew tend to set the bar low for themselves so that they don’t get disappointed with not catching much. So lets hope they have a great day. I have recently just changed bait supplier and have now started to use pellets from West Country Bait company. I also use the barbel ground bait for the feeder. It’s great stuff and has caught me and my clients so many barbel and plenty of 9 to10lb barbel on the Wye. See my home page for the phone number and they have a facebook page too. The weather was warm with a hint of rain in the strong wind. We chose a swim that produces some good barbel however not many monsters come out of it. All the normal tactics were used, feeder and pellets on the hooklink. 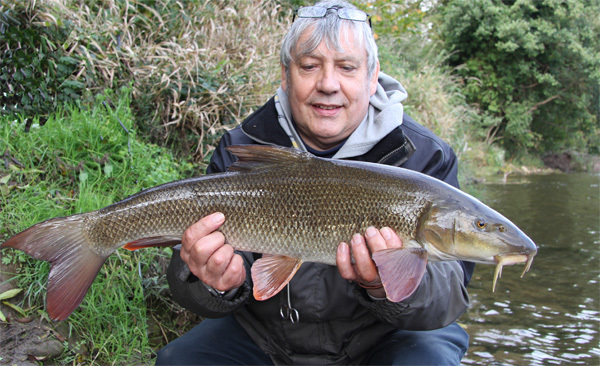 It wasn’t long before barbel started to come our way, most of them were quite small which is a great sign for the future. Then at about 11pm the wind eased however the rain started to pour. 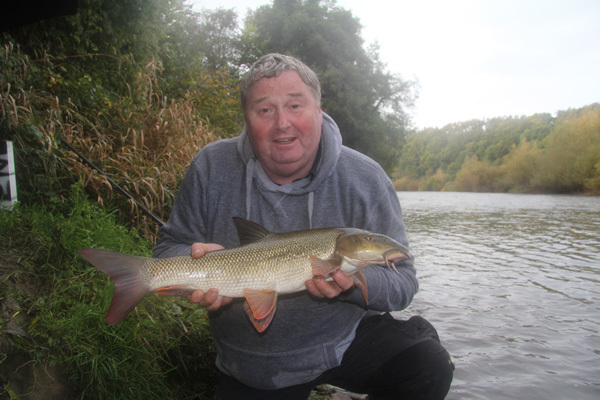 It made for difficult conditions on the bank however the barbel fed all day. Interspersed between the barbel was the odd chub to 4lbs. Rain continued to fall for 5 hours before drier conditions arrived. It was a rotten old day however with 11 barbel and a good few chub there was some bright spots. It seemed every time I put a brew on the stove we caught a barbel, now aint that strange! So with the weather almost getting the better of us we packed up at dark. They headed back to the B&B they were staying at and I returned to Ross on Wye for some fish and chips and to makea few calls on the mobile (cant get a signal in the valley). Then it was into the local pub to dry out a few things while I watched England v San Marino. Rob and Stew joined me to see the second half. I was guiding the next day so it was off to bed in the back of the car for me. This entry was posted on Thursday, October 16th, 2014 at 7:03 am	and is filed under Uncategorized. You can follow any responses to this entry through the RSS 2.0 feed. Both comments and pings are currently closed.